Here is your soundtrack for this post. Picture sitting on the bank of a river, the weather is perfect, temperature 77°F/25°C, sunny, dry, and light breezes. We were sitting on a blanket behind the stage where a band was playing, so the music is live. 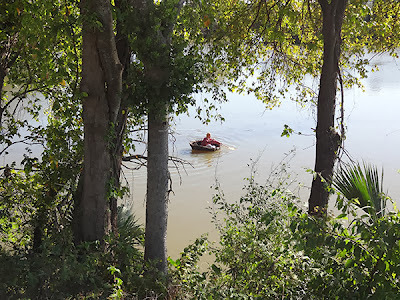 A guy paddled by in a coracle, which I am only familiar with by name because a friend of mine in the UK has one. Considering the recent floods (and the banning of river recreation) he was probably committing a misdemeanor, so I hope his adventure ended well. I didn't take loads of pictures of the bands and costumes this year, as I have done before. Just a few snapshots. 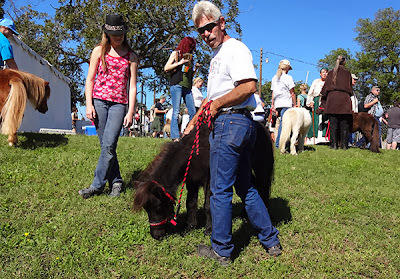 Enjoyed petting the mini-horses, and really... what is cuter than a mini-horse? It would be a tough competition. Princess Neko would be in there (and all cats, really), puppies, baby hedgehogs, mini-horses, etc. MIni-horses cute, but Princess Neko wins hands down. Just don't ask me choose one in room full of baby mammals and marsupials. The setting looks so lovely. Glad there is still some nature left in America. Can't get more Celtic than a coracle! I really enjoyed your clip of the river and the music.